Update 2: In his first public appearance since the unrest began, Maduro appeared on the balcony of the Miraflores palace to assure his supporters that he's "not giving up" and not going anywhere. Blocks away, clashes between protesters and national guard soldiers were escalating. To try and convince Maduro to leave peacefully, the Trump administration on Wednesday offered to develop an "exit solution" for the Venezuelan leader if he elects to leave the country peacefully, according to the Washington Examiner. "We will continue to work with all of our partners who have spoken up very loudly and clearly on this issue in order to, one, encourage them to take further steps to ensure that Maduro and his cronies are not able to loot any further from the Venezuelan people," a senior administration official told reporters. "And by the way, in that regards, to work productively - if Maduro chooses to accept a peaceful transition of power - to find an exit solution for him, in that regards." If Maduro refuses, Trump could step up pressure by authorizing a full oil embargo, or grant Guaido and his provisional government access to millions of dollars in frozen Venezuelan assets. Initially at least, Maduro didn't seem too keen on the US's offer. During his speech, he ordered all US diplomatic personal to leave the country within 72 hours and announced a diplomatic "break" with the US. He called on Venezuelans to rise up and stop the rebels, and accused Guaido of violating the country's constitution. Update: The list of countries recognizing Guaido as Venezuela's legitimate president has grown to 10. In the chaotic aftermath of the latest coup attempt against Nicolas Maduro, Venezuela's US-backed opposition leader Juan Guaido, the head of the Venezuelan assembly has proclaimed himself ‘acting president’ with the explicit backing of the US in what's looking more and more like a successful, US-backed coup. 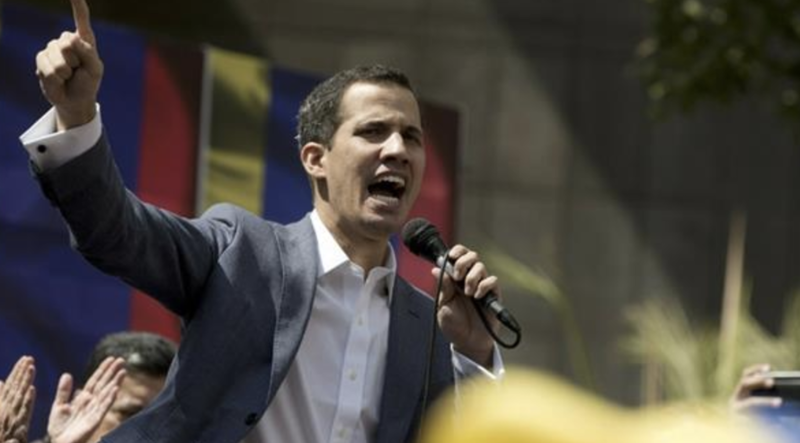 "Today, January 23, 2019, I swear to formally assume the powers of the national executive as president in charge of Venezuela," Guaido said as crowds of people singing the national anthem converged in Caracas central square. During a speech in Caracas, he promised to run the country until free elections can be held. The defiant outburst comes shortly after Maduro started a new six-year term, and one day after Vice President Mike Pence urged Venezuelans to rise up against his corrupt regime. Clashes have continued following a failed coup attempt organized by a group of National Guard soldiers who tried to unseat Maduro. In a retaliatory crackdown, Venezuelan police have blocked Internet access. @joseolivaresm esto debemos retwittearlo.... esto es lo que se debe hacer con los GN que están reprimiendo el día de hoy. ...As tens of thousands of Venezuelans have taken to the streets across the country. At least one military general has joined with the opposition (after US Sen. Marco Rubio encouraged military defections). And in an unprecedented move, the Trump administration announced that it would recognize Guaido as the legitimate president of Venezuela, Bloomberg reported. Canada joined the US in recognizing Guaido, as did Brazil - though Mexico reaffirmed that it recognizes Maduro as the country's legitimate leader. "The people of Venezuela have courageously spoken out against Maduro and his regime and demanded freedom and the rule of law," Trump said in a statement from the White House. Trump published a full statement on his twitter feed. In a statement, Secretary of State Mike Pompeo called on Maduro to step aside and reaffirmed that the US will support Guaido as the country prepares for legitimate elections. After uprisings in the summer of 2017 were brutally crushed by police, the opposition is hoping that a strong turnout on Wednesday will convince the military to switch sides and support the people over Maduro's regime. As Bloomberg's Sebastian Boyd pointed out, Venezuelan bonds rallied on the news (likely spurred by growing optimism that this might be the end of Maduro's reign). It's unclear where Maduro is, or what exactly is going on.